Information: Eugenia and Ghorghe Popescu-Judetz, teachers and authors of books about Romanian folk dance. 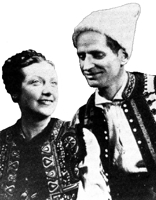 Eugenia and her husband, Gheorghe, were Romanian dancers who worked primarily as choreographers and teachers. Eugenia was born on September 19, 1925 in Giurgiu, a town on the Danube River in the Muntenia region of Romania. Although she trained in classical ballet as a child, Eugenia developed an interest in folk dance that increased after she married. In her early career she was a professional dancer and folk-dance teacher with the National Theater Ballet of Bucharest, performed with the Opera Theater, and taught dance in the High School of the Arts and in the Folk Ensemble of Bucharest. For a time she conducted research with the Romanian Folk Lore Institute, an experience that gave her valuable training for future fieldwork. From 1954 to 1970 she was ballet master and choreographer of the Periniţa Folk Ensemble and toured internationally with them. Throughout these years, Judetzika ("Little Judetz," as she was affectionately called) taught workshops for folk-dance instructors and amateur choreographers, created many choreographies for film and television, conducted field research, and lectured in Europe. Eugenia was the choreographer for the Bucharest Opera. As a child, she trained in classical ballet, beginning as a ballerina with the Romanian National Theater in 1946, later joining both the Romanian Light Opera and the Romanian Opera. From 1954 to 1970, she was principal choreographer for the Romanian folk dance group Periniţa, while Gheorge held the same position for the group Ciocîrlia" She and her husband also choreographed for Romanian television shows and films. Gheorghe was born in 1911 in the village of Beleţi-Negreşti, Muscel district, in the Muntenia region of Romania. He became interested in folk dancing as a teenager and began performing as principal dancer with amateur ensembles in Bucharest. After obtaining degrees from several universities, Gheorghe entered the teaching profession. In the 1930s and 1940s he was leader of and dancer with a number of organizations and toured with some of them nationally and abroad. In 1948 Gheorghe married Eugenia Marisescu, who became his dance partner and research associate. They won first prize in the International Folk Dance Competition in Prague in 1950 for excellence in character dance performance. From 1949 to 1966 he was the choreographer and director of the Ciocîrlia Ensemble. Throughout the years, the affable and energetic dance master also served as guest choreographer for other dance groups, professor of folk dance at various schools and seminars, and jury member at national folk arts competitions. With no formal ethnographic training but armed with enthusiasm and endless curiosity, Gheorghe conducted extensive fieldwork throughout Romania between 1949 and 1972, often accompanied by a fieldwork team that sometimes included Eugenia. He published some of his research in ten books on folk dance, as well as in many journal and magazine articles. As a leader in Romanian folk dance, Gheorghe received numerous artistic awards throughout his life; and in 1957 the Romanian government honored him with the title Artist Emeritus of Romania. It was to capture Romanian dances that Gheorghe took to the field. The couple recognized that the traditional ways of life were changing, and Gheorghe wanted to record the endangered dance culture. In addition, the couple wanted to use the material to develop curricula for dance workshops, to provide methods to teach folk dance characteristics in ballet classes, and to publish dance instruction books. For more than two decades, Gheorghe spent about one-third of his time traveling to various provinces looking for folk dances and new variants. Sometimes the government sponsored the trips so that the choreographer could gather traditional material from which to create performance suites for Ciocirlia. When local or regional amateur groups hired Gheorghe to choreograph certain pieces, such jobs allowed him to explore the dances of that area. On other occasions he set out on his own, perhaps as part of a trip to judge a national competition or to attend a folk festival. Wherever Gheorghe went, he was watchful, constantly questioning dancers and musicians, forever jotting observations in one of the forty-five notebooks that contain his fieldnotes. Eugenia accompanied him part of the time and did her share of notating, describing, and interviewing. When funding permitted, research was conducted by a fieldwork team that usually included a musician/composer who notated the melody played with the dance under study, either on the spot or later by listening to a field recording; a costume expert who studied the traditional dancewear, often locked away in trunks in the villagers' homes; and, sometimes, performers with Ciocîrlia who absorbed the authentic flavor of the dances. If the team went to a village well-known for its dancing, the local authorities usually organized a get-together for them in the evening after the workday. Young and old, the villagers gathered, at first a bit wary of the meeting. Gheorge and Eugenia supplied alcohol to help create a sociable atmosphere, and in a short time the people relaxed and began to dance and answer questions. Often, especially in the early years of fieldwork, the older peasants were reluctant to share their dances and songs for fear that their culture was being stolen. However, the fieldworkers' expertise and Gheorghe's genuine interest enabled them to develop a productive rapport with their informants. Moreover, as Gheorghe's fame as a national dance leader grew, musicians and dancers became eager to help with his research. Whether attending these constructed events or observing local celebrations, the fieldwork trips were times of cautious treasure hunting, particularly in the 1950s. During these early years, the researchers traveled by car (if they were lucky) but more often by train, cart, or on foot from village to village. At times they did not know what delightful discovery awaited them at the next site. Or what danger. Both local officials and peasants sometimes were suspicious of this small band of artists, and did not always understand or believe their purpose. Fortunately, Gheorghe's reputation and diplomatic skills helped to protect their lives and work. As part of a cultural exchange program, Eugenia traveled to the United States in the late 1960s to teach Romanian folk dance workshops. In about 1968, Eugenia produced three Folkraft albums from which comes the photo above. Gheorghe died in on August 10, 1972. In 1973, Eugenia returned to New York to work on a book and recordings documenting her husband Gheorge's unique dance notation system. It also covered their work preserving Romanian folk dance and music (music recordings for the dances accompany the book), and Fredda Seidenbaum was hired to edit it. Both Eugenia and Gheorge were internationally famous as dancers, teachers, choreographers, and folklorists. Fredda and Eugenia instantly became friends, a friendship which lasted over 30 years. Eugenia was hired as Adjunct Professor at Duquesne University Tamburitzans Institute of Folk Arts and to choreograph for the "Tammies." She later received a master's degree in theology from Duquesne University and a doctorate in theater criticism from the University of Pittsburgh. Eugenia was also knowledgeable in the fields of philosophy, religion, linguistics (she spoke several languages), art and theater. She was a renowned author of over a dozen books on Turkish culture and on Dimitrie Cantemir, a Romanian prince who standardized the system of musical notation used in 17th century Ottoman Turkey. Eugenia was an accomplished artist, working and exhibiting in acrylics, watercolors, pastels, and other media under the name E. Kateri. Her extensive scholarly works (she was in the middle of a project when she died) were surpassed by the dedication, warmth, energy and enthusiasm that she shared with everyone who came in contact with her. Besides the knowledge she gave those she taught, Eugenia left other great legacies: she donated materials that she and her husband collected over more than five decades to the Library of Congress, including theoretical and other research on Romanian dance and music. In addition, she contributed her large personal collection of Romanian folk costumes to the Duquesne University Tamburitzans. In the Library of Congress, the Gheorghe and Eugenia Popescu-Judetz Collection spans the years 1938-1974 and 1995, with the largest portion dated 1950-1972. Material in the collection includes theoretical research, and ethnographic descriptions. In addition to the record of dance and music, other aspects of the collection are also significant, such as the documentation of the development of the dance-notation system. Gheorghe created the unique notation out of his need to record dances in the field accurately and quickly. From 1949 to 1955 he worked on a system that focused on footwork, including the positions and movements of the passive (non-weight-bearing) foot. Gheorghe continued to refine the system and used it in choreography for the ensemble, published books, and teaching. Eugenia employed the notation for the same purposes and drew on it when teaching and choreographing Romanian folk dance in the United States. The breadth of materials in this collection demonstrates a progression of scholarly research and performance development, and provides insight into dance research and performance in communist Romania. The manuscript materials range from rough field notes describing folk dance variants in various villages to colored diagrams of choreographic works staged for professional performance. Eugenia died on December 20, 2011 after a long battle with cancer and is survived by several cousins in the United States. She was much more than a teacher, she was an incredibly brilliant, productive, creative, multi-faceted, fun-loving woman. She will be deeply mourned and missed by those who knew her not only all over this country, but also all over the world. The foregoing was excerpted from the the webpage Folklife Center News, American Folklife Center, The Library of Congress, Fall 1995, Volume XVII, Number 4, ISSN 0149-6840 Catalog Card No. 77-649628, and from correspondence from Fredda Seidenbaum to Ron Houston of the Society of Folk Dance Historians. Akdale. Eugenia Popescu-Judetz, Softcover, 2006. Brîu: Joc popular muntenesc. Gheorghe Popescu-Judetz, Softcover, 1957. A Catalogue of the Turkish Makams. Eugenia Popescu-Judetz, Softcover, 2010. Jocuri din Banat. Gheorghe Popescu-Judetz, Softcover, 1956. Jocuri Populare Olteneşi. Gheorghe Popescu-Judetz, Softcover, 1958. Jocuri Populare Romňnesti. Gheorghe Popescu-Judetz, Softcover, 1959. Judetz Folk Dance Notation. Gheorghe Popescu-Judetz, Softcover, 1979. Popescu-Judetz and Roncević, James. Meanings in Turkish Musical Culture. Eugenia Popescu-Judetz, Softcover, 1998. Prince Dimitrie Cantemir, Theorist and Composer of Turkish Music. Eugenia Popescu-Judetz, 1999. Sixty Folk Dances of Romania. Eugenia Popescu-Judetz, Softcover, 1979. Sources of 18th Century Music. Eugenia-Popescu Judetz, Softcover, 2000. Studies in Oriental Arts. Eugenia Popescu-Judetz, Softcover, 1981. Tanburi Kucuk Artin, A Musical Teatise of the Eighteenth Century. Eugenia Popescu-Judetz, 2002.